Bugs and pests are more than just an annoyance, they can also pose a potential risk to your health. For decades, scientists have know that ticks carry certain diseases that can be transmitted to both humans and pets. In addition to Lyme Disease and Rocky Mountain Spotted Fever, ticks are now responsible for infecting humans with a whole new type of bacteria. While the disease has not yet been identified in patients in the United States, it has quickly spread across Europe and China. Experts contend that there is no immediate threat to U.S. residents, but that it is simply a matter of time before this disease migrates overseas and makes its way to the States. Fortunately, there are affordable residential pest management solutions that can reduce your risk of coming into contact with a wide variety of pests that can harm you and your family. Regular visits from a trusted pest control company can assess your situation and ensure that your home is protected before you experience an infestation or other problems. If you are shopping around for a New Jersey pest control company to service your home, be sure to look for a established business that can provide customer testimonials and a range of treatment options. At Allison Pest Control, we offer a free home inspection to get you started. Let our knowledgeable service professionals take on your pests and keep your family safe from tick bourne disease. A Level Red tick threat has been issued for the Northeast and Mid-Atlantic regions, including Monmouth County, New Jersey. In raising the summer tick threat to its highest level, the University of Rhode Island Tick Encounter Resource Center warned residents and vacationers to protect themselves and their pets from blood-feeding ticks and the diseases they spread. Researchers monitoring tick populations are reporting twice as many ticks this year as last year. The heavy winter snows and wet spring have created perfect breeding and development conditions for New Jersey ticks. Emerging from the nymphal stage over the next several weeks, hungry blood-feeding ticks will be trying to latch onto hosts to cadge a meal. Wild animals, birds and pets are common tick targets; but people who walk through a tick-infested area are at equal risk. Pets and pet begging can also expose families to ticks and the diseases they carry. Ticks typically inhabit grasslands at the edges of wooded areas. Climbing out onto the tips of grass blades, these parasites wait for passing animals. As an animal – or person – brushes past, ticks scurry onto its legs or body. After crawling onto a host, this parasite climbs up toward the soft, exposed skin around the head, neck and ears where it inserts its feeding tube to feed on the blood of its host. If not disturbed, ticks may stay attached and feed for several hours to several days. During feeding, poppy seed-sized nymphs and apple seed-sized adults can more than double in size. Protect your family from tick-borne diseases. Call the expert tick exterminators at Allison Pest Control today. I don’t know of a single person that has not had a tick crawling up their leg or attached to some area of skin this year and many New Jersey residents report that they are frequently pulling the bloodsuckers off of their pets, despite topical tick treatments. Yes indeed, it is tick season report Monmouth County, NJ exterminators. Ticks have been out in full force, ready to bite any type of warm blooded animal (and that includes us humans). 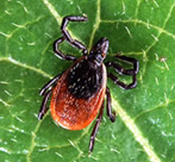 The tick that has been most commonly seen thus far is the black-legged tick, otherwise known as the deer tick. It is well known that ticks are transmitters of tick-borne illnesses. The most commonly known tick-borne illness is Lyme disease which was first discovered in Lyme, CT in 1975. Lyme disease is a debilitating disease for any person or pet that is unfortunate enough to contract it. 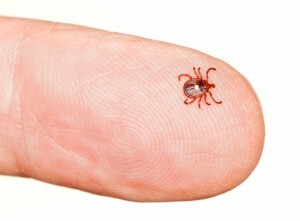 The tell-tale bulls eye rash after a tick bite is a good indication that a person has contracted the disease but not all people develop the rash. Lyme disease will make a person have a fever, headache, skin rash, fatigue, and migraines. If the the disease is left untreated then it can spread into the nervous system, joints, and the heart. There are other dangerous diseases that the black legged tick transmits which are known less by the public than Lyme disease. People should also be aware of Babesiosis and Ehrlichiosis. In addition, the American dog tick is known to transmit Rocky Mountain Spotted Fever, Tularemia, and STARI. Avoiding ticks and their dangerous disease are extremely important. Hiring a Monmouth County, NJ exterminator to provide a barrier treatment around your property will help to keep these blood sucking pests from gaining access to your home. Call Allison Pest Control for expert help today. Monmouth County, NJ exterminators are on high alert this summer as reports of tiny little vampire (black legged ticks) have been on the rise this past spring and now into the summer months. It is widely believed by entomologists from coast to coast that many pests, including ticks, will be out-of-control this summer due to the mild winter that was experienced throughout the east United States. The black-legged tick is of most concern for residents in the state of New Jersey. Residents must take the threat of contracting Lyme disease from the black-legged tick seriously. Since its discovery in 1975 in Lyme, Connecticut, Lyme disease has been the most frequently reported tick-borne disease in the United States. Immature ticks are more predominately found attached to humans and pets during the months of May, June, and July. During these months, ticks are smaller than adults, so they are often not detected until they are fully engorged. Ticks that are removed before they have been attached to a person or pet for 24 hours have a lesser chance of spreading any type of dangerous disease to their host. You can protect your family and pets by hiring an experienced Monmouth County, NJ exterminator like Allison Pest Control for all of your pest control needs. The bubble has now burst on the theory that deer ticks are not a troublesome pest during the winter months. In the past, it was mostly believed that New Jersey residents need only be worried about ticks once the weather warmed, but this is no longer the case. A woman was found to be bitten by a deer tick this past January reported CBS New York on January 25, 2013. According to reports, the 81 year old woman believed that her 30 pound weight loss, confusion, loss of appetite, and inability to walk well was a result of her lymphoma returning or perhaps even dementia. Reports are that her lab results were negative, yet she did show signs of Lyme disease. Testing of her spinal fluid gave her doctor at the Hunterdon Medical Center the answer to her mysterious illness. The testing confirmed that she is the first person in the United States to be diagnosed with a new deer tick disease! The great news is that this new disease was discovered and that with treatment, the woman has made a full recovery. The bad news is that the disease exists and not many doctors or patients will know to look for it, or the symptoms that accompany the disease. Lyme disease is widespread throughout the United States thanks to the abundant amount of deer ticks that exist. Lyme disease is dangerous and affects humans and pets alike. This is another reason why it is so important to hire a Monmouth County, NJ pest control professional for pest control treatments at your home or business.